 Share the love with heart-shape brownies. Dutched cocoa removes the bitterness by adjusting the pH with alkali. 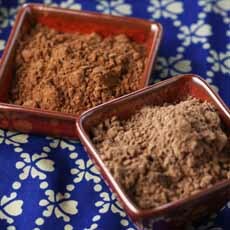 Dutched cocoa at left, and natural cocoa at right (photo courtesy Silk Road Spice Merchant). All you need are a brownie mix and a heart-shape cookie cutter. We prefer made-from-scratch, of course. The recipe below is from King Arthur Flour. You can save time with the from-scratch recipe by omitting the chocolate ganache. Brownies are plenty sweet and chocolatey without topping them with more sweet chocolate. If you do want the ganache, we suggest the drizzle rather than the full ganache coating (i.e., frosting). Prep time is 20 minutes, bake time is 28 to 30 minutes. 1. PREHEAT the oven to 350°F. Lightly grease a 9″ x 13″ pan. Line with parchment and grease the parchment. While this step isn’t strictly necessary, it makes getting the brownies out of the pan a whole lot easier. 2. MAKE the brownies: In a medium-sized microwave-safe bowl, or in a saucepan set over low heat, melt the butter. Then add the sugar and stir to combine. 3. RETURN the mixture to the heat (or microwave) briefly, just until it’s hot (about 110°F to 120°F) but not bubbling. It will become shiny-looking as you stir it. Heating this mixture a second time will dissolve more of the sugar, which will yield a shiny top crust on your brownies. 4. STIR in the cocoa, salt, baking powder, and vanilla. Whisk in the eggs, stirring until smooth; then add the flour, chips and espresso powder, again stirring until smooth. Spoon the batter into the prepared pan. 5. BAKE the brownies for 28 to 30 minutes, until a cake tester or toothpick inserted into the center comes out clean or with just a few moist crumbs clinging to it. The brownies should feel set on the edges and barely set in the center. 6. REMOVE the brownies from the oven and cool them on a rack for 20 minutes before turning them out of the pan. Loosen the edges and use a spatula or turner to loosen the bottom as much as possible. Then flip the pan over onto another sheet of parchment or wax paper. Peel the parchment off the bottom of the brownies and let them cool completely. 7. USE a 2″ heart cutter to cut 3 dozen hearts out of the brownies (or use a smaller or larger cutter to cut more or fewer hearts.) Place the hearts on a rack set over a piece of parchment or waxed paper. 8. DECIDE whether you want to drizzle the hearts with ganache, or coat them completely. You’ll make the lesser amount of ganache for drizzling, the greater amount for glazing. 9. MAKE the ganache: Combine the chips, cream and corn syrup in a microwave-safe bowl. Heat until the cream is very hot. 10. STIR the mixture until the chips melt. 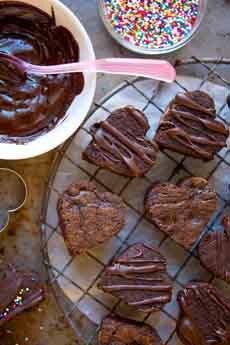 Then, drizzle over the brownie hearts or spread to cover completely. Cocoa powder in its untreated state is called natural cocoa. It is yellowish-brown in color. 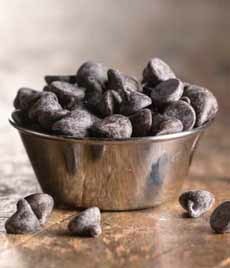 Dutched chocolate, or Dutch process chocolate, is a deeper brown color, which leads most people to think that it is richer and has more chocolate flavor. In fact, the alkali added to Dutched cocoa changes the pH of the cocoa to make it milder in flavor than natural cocoa, not deeper. In 1828, Coenrad Johannes van Houten, the same engineer who developed the hydraulic press that created cocoa powder by crushing the nibs to separate the fat (cocoa butter), developed the process of treating the nibs with alkaline salts (alkali)* to neutralize the acidity and bitterness prior to crushing. Van Houten was Dutch, so the process became known as Dutch process, or Dutching. Because the pH is changed, you should not substitute these two types of cocoas in baking. While both will make a nice cup of cocoa, leavening will vary because of the differing acidities. *Alkali is a chemical salt that neutralizes or effervesces with acids, such as lime or soda. If you remember back to high school chemistry, it turns litmus paper blue. 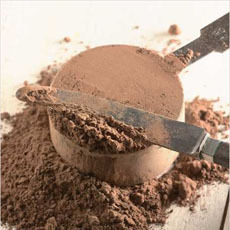 The process darkens the cocoa powder, changes its taste by reducing bitterness, and increases the dispersability of cocoa powder for various applications such as flavoring beverages.